Are you looking for dead deer removal in your area? Know that this is not a job for the public due to health and safety hazards. It’s best to call the professionals at Twin Forks Pest Control. Spotting a dead animal near or on your property can be a devastating sight for anyone, but it does unfortunately happen. Not only is a dead deer an eye sore, but the carcass can attract other scavengers and unwanted wildlife to your yard, which can bring disease, parasites, or dangerous predators to your home and property. Once you use Twin Forks to handle your wildlife removal needs, you’ll never call anyone else. Why Should You Call a Wildlife Removal Service? Calling wildlife control experts could be the difference between life and death. A dead deer, along with any other wildlife, should never be handled by anyone other than a professional, as the dead animal can carry potentially fatal diseases. 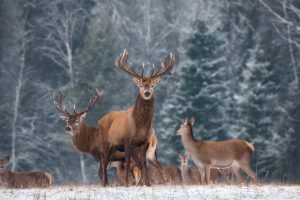 According to The Department of Environmental Conservation, Chronic Wasting Disease (CWD) which is a rare but fatal neurological disease found in cervids (members of the deer family) can easily be transmitted to humans. Disease can pose a major risk to people who may try to dispose of a dead deer on their own without proper knowledge or experience in the matter. Among various other disease possibilities such as Lyme disease or other tick-borne disease exist. Other threats to consider are the attraction of coyotes or violent birds. Keeping a distance from the deer and calling wildlife control immediately upon discovery will keep your family or loved ones safe and sound while the experts take care of the disposal. The team at Twin Forks are the licensed professionals that you need for all of your wildlife control needs. Our team will work quickly to humanely remove the animal from your area. Our work is guaranteed in all fields so you don’t have to worry about any hiccups along the way. Give Twin Forks Pest Control a call today at 631-287-9020 or fill out our contact form for a free estimate to learn more about future or present dead deer removal services. Whether you’re in Montauk or Southold, Twin Forks can help!